Barry Hilton. Hire comedian Barry Hilton. 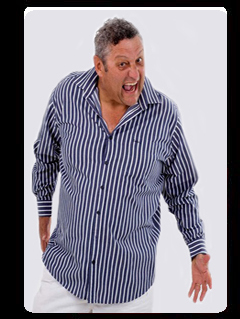 Book Barry Hilton "The Cousin"
Barry Hilton, born in 1956 in Zimbabwe and moved to South Africa to become a comedian, an actor and a corporate entertainer and is best known for all his live stand-up comedy shows. He has performed in countless venues and shows around the world since 1983. Barry in his recent years of his career has reached prestigious acclaim to being the first South African comedian to perform at the London Comedy Store. He has also been invited to perform at the Sydney Comedy Store while touring in Australia in 2011. He is the only South African comedian that has sold out venues of over 4000 people for his one-man comedy shows. Barry has performed for more than 150 comedy shows worldwide which includes concerts, corporate events and functions. Barry is the first South African to perform at the Wild Coast Sun International in Kwa-Zulu Natal. He is the first South African comedian to perform at Sun City Extravaganza in 1986 and the first to perform at the Runaway Bar - a Johannesburg Club that catered to 95% British immigrants in the late 80’s and early 90’s. Barry has also performed on television advertisements and he is mostly seen in the Savanna Cider advertisements where he plays as a barman named Larry since the campaign opened in 1999. He has released and sold 5 DVDs for his stand-up comedy shows. Barry has appeared in the VW Fox, Spray and Cook, Sunday Times (SA), Nashua Printers and Roman’s Pizza commercials. Barry Hilton appeared in the television sitcom series, Funny Business and in “Catch a wake up” - a breakfast show in 1996 to 1997. He hosted on SABC 3 a series called “Funny you should know that” and was on air for 13 episodes in 2003. Barry started calling people “My Cousin” because he was and still is terrible at remembering names. Therefore his fan reciprocated dubbing him “The Cousin”. Barry has been married 3 times in his life and he is currently living in (PE)Post Elizabeth, South Africa with his third wife Sandy and his son Jack. He has six children the youngest Jack. Jami, Robin and Tyler is staying in the UK while Bradley stays in Benoni, South Africa and Tracey resides in Cape Town, South Africa. The Godfather of comedy Barry “The Cousin” Hilton known to be one of South Africa’s best comedians in the country. His one-man shows are over the charts and his tickets have been sold out countrywide. Book Barry Hilton NOW!! !